Two fantastic Australian wines; a great gift for every wine lover. Region : Riverland Grape Variety : Shiraz, Cabernet Sauvignon ABV :13.5% Stopper : Screw-cap Full bodied red wine. Vibrant red with dark purple hues in colour, on the nose, aromas of plum and blackcurrant with notes of spices. High tannins. Well-balanced in acidity. Rich and intense red wine in style. On the palate, fresh, youthful, balanced and fruit-driven, deep and rich, touch of raspberry, jammy and fleshy mouth. It has long finish. Pairs with beef and venison. Drinking temperature : 15-18 °C. Region : Barossa, Grape Variety : 100% Chardonnay, ABV : 12%, Stopper : Screw-cap, Medium bodied white wine. Pale straw with green hues in colour, on the nose, aromas of lime and passion fruit with notes of vanilla. Light tannins. High acidity. Buttery and complex white wine in style. On the palate, fresh, dry and crisp, sharp and touch of tropical fruits flavour, youthful and savory. It has zesty finish. Pairs with mushroom bbq and various type of cheeses. Drinking temperature : 9-12 °C. 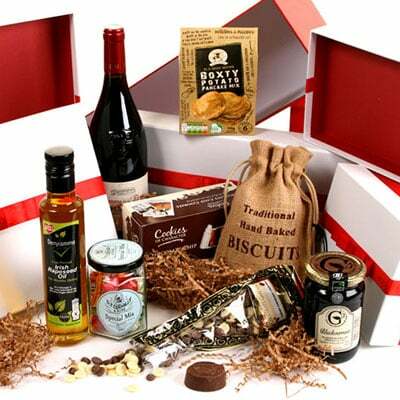 The hamper is presented in wooden wine gifts box with sliding lid. Stylish and reusable, the basket is packed inside a separate shipping box for secure transport.